The Present Conservative club was founded in the early 20th century, around 1906, and was at the other end of Seaview Road. Having persuaded Charrington & Co to buy the present premises, the club moved in 1921. The membership slowly increased and the building underwent much structural and decorative improvement. However, it became obvious that they were enhancing a building that didn't belong to the club. 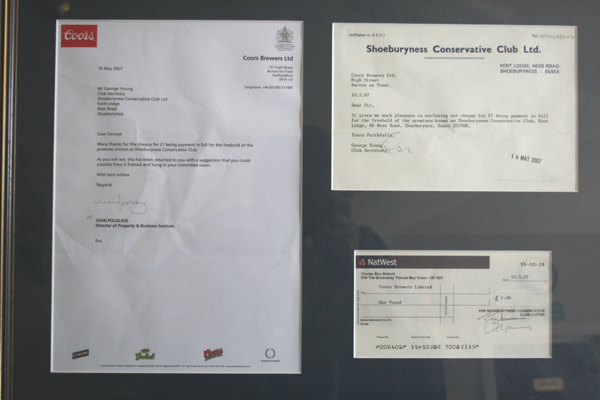 The committee approached Charrington with a view to buying the freehold from the brewery. Charrington, perhaps unsurprisingly, resisted the approaches on the basis that they might well lose the business if they allowed the club to go their own way. The club didn't give up on the idea and finally in 1982 they negotiated a new 25 year lease for the sum of £100,000 with no rent during the period and the option to buy the freehold at the end of the lease. The only provision was that the club had to adhere to the terms of the lease. 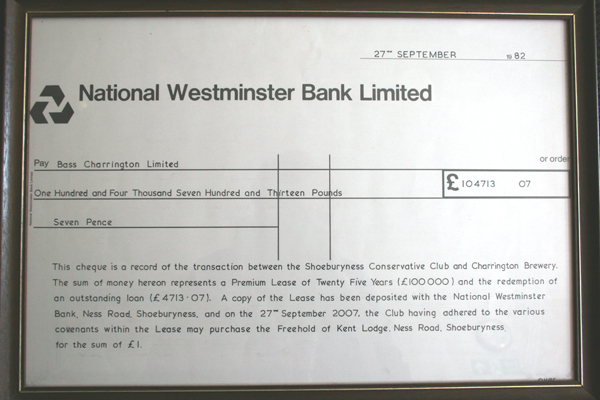 The club managed all the terms and was rewarded in 2007 with the freehold of the clubhouse by the new owner, Coors, for the princely sum of £1! As a member of H.M.Forces, I returned from India and active service in February 1921 and, being a rank Tory, I immediately made enquiries about a local Conservative club. My enquiries revealed that the club had moved from premises at the top end of Sea View Road and taken over Kent Lodge, our present headquarters. I ascertained that a fellow named Dendy was a part time Secretary and also Ammunition Foreman on the then School of Gunnery and as I belonged to the same School of Gunnery I had no difficulty in contacting him and becoming a member of the club. They called themselves "The Shoeburyness Conservative Working Men's Club" and I must confess I wasn't very impressed on first introduction. Bare floor boards, saw dust on the floor and spittoons bestling around the foot of the bar. I got an early recommendationto serve on the committee and the old hands soon hated the sight of me, they were used to hawking and spitting in the spittoons and poor Mrs. Apperley, the Stewards Wife had the daily filthy job of cleaning them. I had such a dust up at my first Committee meeting and was responsible for the removal of the sawdust and the filthy spittoons, how the old boys hated me, "You can't do things like that"....."This is a working man's club", BUT George persisted, got down some heavy lino for the bar and games room and things were a little more pleasant. The next hurdle was overcoats and hats, straight into the bar with overcoat and still wearing their headgear. That activity ceased when the Committee(with me as prime mover) ordered the erection of pegs with an appropriate notice stating that members should remove their headgear before entering the bar. The Committee eventually beat the old boy's down but they hated it. No darts in those early day's, beer at 4d a pint with "Devil's Brew" at 6d. Two pints of Devils Brew and you would be talking to your relations. The games room at 6 o'clock was choc-o-bloc with the old hands playing Shove Ha'penny, Cribbage, Phat and similar games with the more interlectual having a game of Solo in the corner. Gambling strictly forbidden but we used the Cribbage Board as a marker and at 10.30 pm we sorted out our winnings and losings. Being a Billiard player of some quality, I was asked to take control of the Billiard room. The part time cleaner wasn't up to much, so I bought brass pegs and hung all the private cues up, instead of having them in a pile in the corner of the room. The part time cleaner (who happened to be the Secretaries Son) was up in arms and reported me to his father, I was supposed to be upsetting the old members, so I removed myself from the Committee and have been an ordinary member ever since. With gradual improvements the senior Warrant Officers of the Navy and Army were attracted to the club and they brought a higher class to the general membership. They have passed to the great beyond long since and at 89 years of age I expect to be joining them, still, not so bad after membership of 63 years. Some difference from those early days and present Hotel conditions of our club. I congratulate the Officers and General Committee in their efforts to continually improve the club for the general benefit of all members. Mr. George Rendell actually made 91 or 92 years of age before joining his fellow Army Warrant Officers in "The great beyond"